The Caribbean Reef Octopus is one that has a fascinating look to it. The combination of blue and green color is something that gets people’s attention. There can be brown on them too which ranges in shades of color. This is their coloring though when they are in their normal state. They are able to change the pigment of their body with ease. This serves as a type protection for them from predators. They are often mistaken for Common Octopus species. One way to definitely tell them apart is by looking at the eyes. The Caribbean Reef Octopus has very dark circles of color around them. The body is about 5 inches in length but the span of the arms is quite a bit more. This can cover the space of about 23 inches. The overall size of them really depends on the particular region where they happen to live. This is a medium sized type of Octopus, with an overall weight of just over three pounds. They have a head that is very large which is part of their mantle. The eight arms are extremely thick. 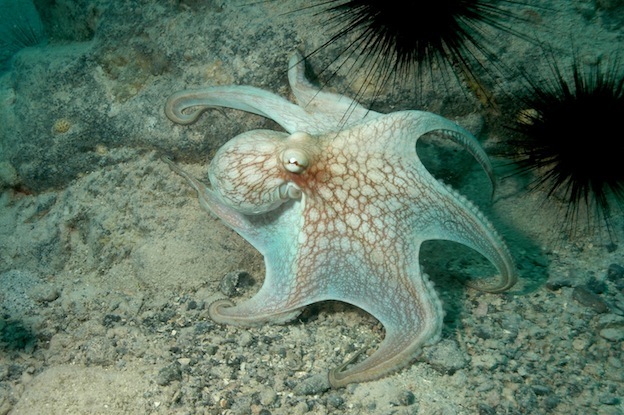 They aren’t able to move as quickly as other species of Octopus but they don’t have to. Their abilities to lie flat allow them to appear like part of the natural scenery instead of a living creature. The body is often arranged in a pattern that looks like a parachute that is open and lying on the ground. While there are several theories about the evolution process for the Corral Reef Octopus there really isn’t any concrete evidence. It is believed that the Octopus has been on Earth for millions of years. Finding fossilized remains though is extremely difficult. We really have nothing to compare them to now versus early species. Hopefully we will one day develop the right technology to allow that to happen. In the mean time though it can be fun to explore the possibilities. One of them is that the Octopus used to crawl around on the bottom of the ocean with two legs. The development of the additional legs helped it to use its senses for survival. Like all Octopus they live on their own out there. They don’t seem to be too bothered though when other types of Octopus come into contact with them. The passage is often something that occurs without any interaction at all. The only time they will pay any real attention to others around them is when they are interested in mating. While all types of Octopus are very intelligent, this specific species is said to be among the most intelligent of them all. Extensive research though is almost impossible on them. This is because of the fact that they don’t live very long lives. It is believed that their intelligence would continue to develop and to improve though if they lived longer. This is one type of Octopus that has quite a large dispersement out there. They are found around the Bahamas, and of course the Caribbean where their name comes from. They are well known in the Atlantic Ocean, especially around the Western region of it. They love to reside in sea grass and along the corral reefs out there. They do glow at nigh under lighting due to their coloring. Generally you will only find the Caribbean Reef Octopus out there in areas where they can be in warm water. They will move around from one location to another, never staying for more than a couple of weeks in any one set location. The females that have laid eggs are easy to notice though. They will continue to hover over a given area until they die or their eggs hatch. The Caribbean Reef Octopus spends most of its night looking for food. They majority of the diet is made up of crustaceans. They will capture them in the webbing of their arms, bite to release venom, and then the paralyzed critter won’t have any way to survive against it as the beak breaks the shell and eats what is inside of it. Various types of small fish are also known to be part of their diet as well. Since this species of Octopus doesn’t live for very long, they are able to mate when they are from 3 to 4 months of age. The males seem to mature sooner than the females. The males will die sooner than the males as their role in mating is done once they have successfully released the sperm sac from their body to that of the female. The males will actually fight with each other for the right to be able to mate with a given female. They would likely not be so eager to do so though if they knew that they would die. This fighting though is nature’s way of ensuring that the best genetic materials are able to be passed on to the future generations of offspring. Even though the male is able to win that battle, he is far from done fighting. The female may not want to mate with him at all. If she doesn’t and he continues to pursue him she may bite off body parts or kill him. Yet the desire to mate is very instinctive for the males so they will continue to pursue a female. She generally will take part in mating as long as her basic needs are being met. The female will die after mating too but she has one more aspect of life left to complete. Her mission at that point in time is to make sure as many of her eggs are able to be fertilized by the sperm and to hatch. There can be as many as 500 eggs that she will release from her body. She will lay them in either January or February. The warmer the water temperature is the sooner she will release them. The incubation period will also be affected by the water. When it is warm the may only have 50 days or so before they hatch. In cooler temperatures it can be as long as 80 days though. The young offspring are amazing – able to move quickly through the water and to instinctively find food. They have a very quick growth rate too due to the whirlwind life span for them. Depending on the location where the Caribbean Reef Octopus lives, it can have some concerns with various types of predators. Among them include eels, stingrays, small species of sharks, and various types of fish. They do put up a very good fight against these types of predators. If they can’t run then they will release ink from their bodies to confuse the predators. This is one species of Octopus that humans continually hunt as well. They are considered to be great for various types of meals. You can buy them to cook on your own or you can eat at certain restaurants that offer them on the menu. They aren’t in any jeopardy though of being extinct as there is more than enough of them out there that live in the wild.